Looking back over the years we came to realize that we have not done updates of the RainyDayGarden during July and August. We are not quite sure why, but we thought we would post one this year as the garden is extra lovely this Summer. 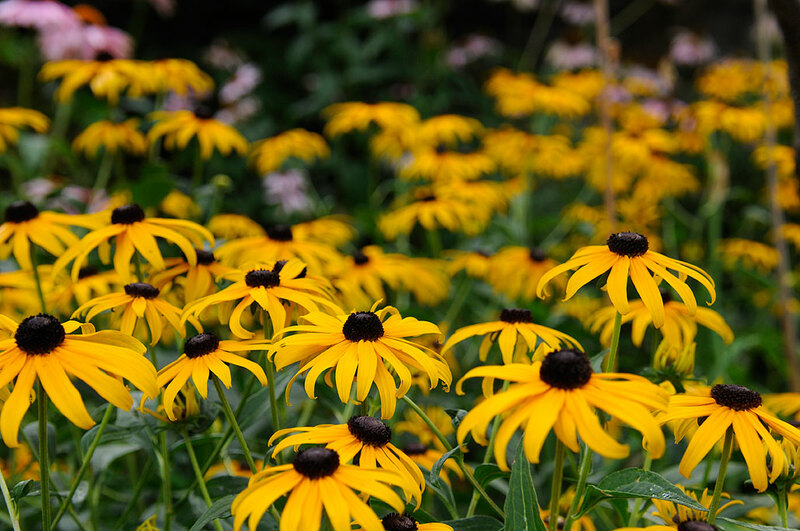 Things which are in full bloom during the hot days of August in the RainyDayGarden are the Cone Flowers (Echinacea purpurea), Black Eye Susans (Rudbeckia hirta), Butterfly Bushes (Buddleia davidii), and Passiflora (Passiflora incarnata). 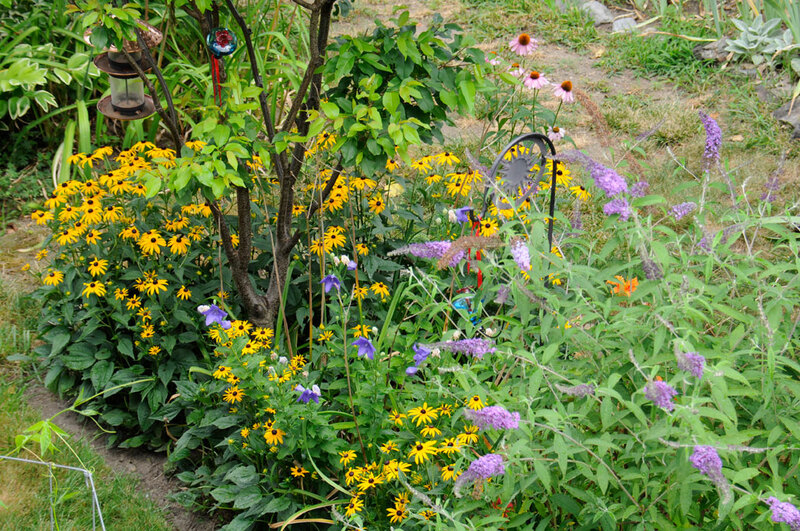 They do well because they are all very low maintenance, extremely drought-tolerant, and attract all kinds of visitors (bees, birds, butterflies, etc). We know the passiflora did well last year because it came back on its own, so much so that by the end of the season it was all over the place. While we were extremely excited to see that it had survived the Winter again, we were a little concerned that this year it would completely take over. We thought it might be a good idea to provide a frame for it so it could climb up that instead of on everything else, but what to use? A few years ago we got a bean tower from the Gardener’s Supply Company and thought it may be perfect for the passiflora. Sure enough, the 5-foot tall cage worked out exactly as we had hoped. Even when it was windy out, the structure was super stable due to its 10″-long in-ground legs. The openings were small enough for easy climbing, but large enough for the vine to snake through. It was really nice to see flowers blooming at different levels. We think this will be our primary use for the cage from now on. In July, we got a few hummingbird feeders to see if we could entice a few of those little birds to visit the garden. We are sorry to report that we have yet to have any sightings (we think maybe it was a little too late in the season). However, as the feeders are quite attractive, they are nice to have in the garden nonetheless. We are still hopeful for a sighting before the end of the year. Even though we have not had any hummingbird visits, we have had plenty from butterflies. 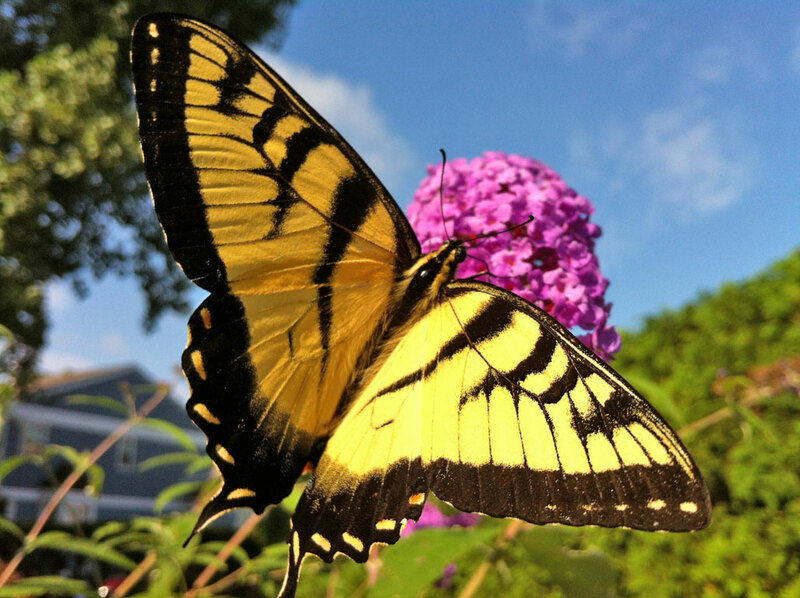 One frequent visitor is this giant yellow swallowtail (Papilio glaucus). Our efforts to capture it on camera proved challenging as the timing of its appearance was unpredictable. We managed to get these images only because we had the iPhone 4 handy during one of its appearances (not bad pics for a cell phone). In another month the nights will start to get cooler, leaves will begin to turn, and we will stroll into Fall. The green of Summer will give way, and colors such as red, orange, and brown will begin to dominate the landscape. We mark the changes of the season with the work we must do to get ready for them. So, off to Home Depot we go.